Hessenland is as much about the stories beginning beneath the soil as it is about the ventures happening within its doors. For the two generations of Ihrigs that have laid the foundation for Hessenland Inn, and now, the 5-acre Estate Winery which surrounds the original venue and gardens, ‘schatz’ has long been the German term of endearment for the family members who lie at the heart of this labour of love. 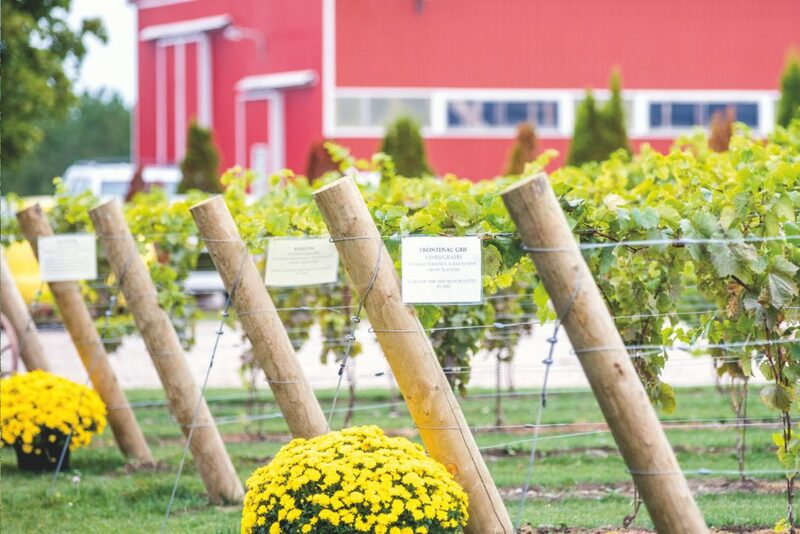 Along with deep appreciation for the area’s heritage and rich agricultural traditions, juxtaposed alongside the history of the Ihrig family and the ever-evolving story of next generations, Schatz Winery offers a distinctly Huron-inspired palate with a nod to the places and spaces from which they’ve come to those that continue to bring people together. The iconic Hessenland tower features on the Schatz Winery logo. 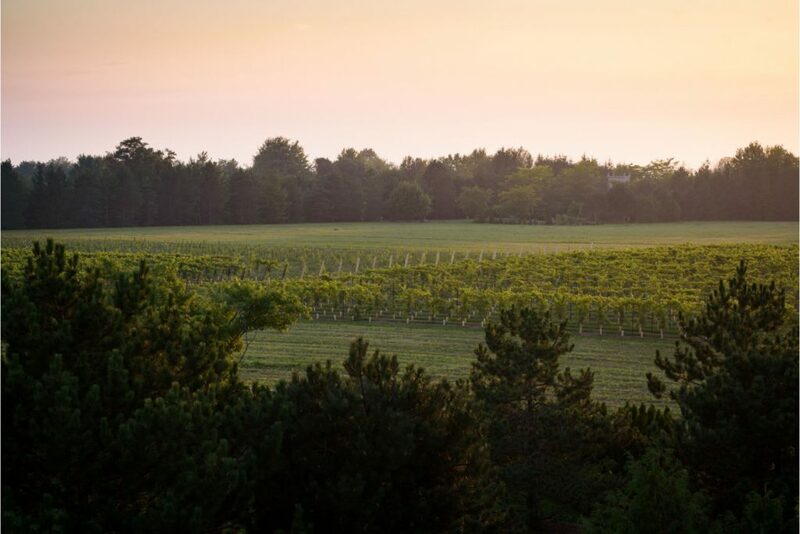 The panoramic viewing deck and winding tower staircase offer the perfect vantage point for taking in the breathtaking views of the vineyard, gardens and venue spaces below, all within a short walk to the Lake Huron shoreline. Where once the beloved Hanoverian horses of the late Ernst Ihrig made their paddocks, now exists the hand planted 5-acre micro-vineyard that is Schatz Winery at Hessenland Inn. Since the inaugural vine planting in 2015, Chef and Owner-Innkeeper turned viticulturist Frank, has lead a team of family, friends and community volunteers in tending to a family of grapes inclusive of Marquette, Petite Pearl, Riesling, Chardonnay, Cabernet Franc, Frontenac Gris, Siegerrebe (Victory Vine), Frontenac Blanc and La Crescent. 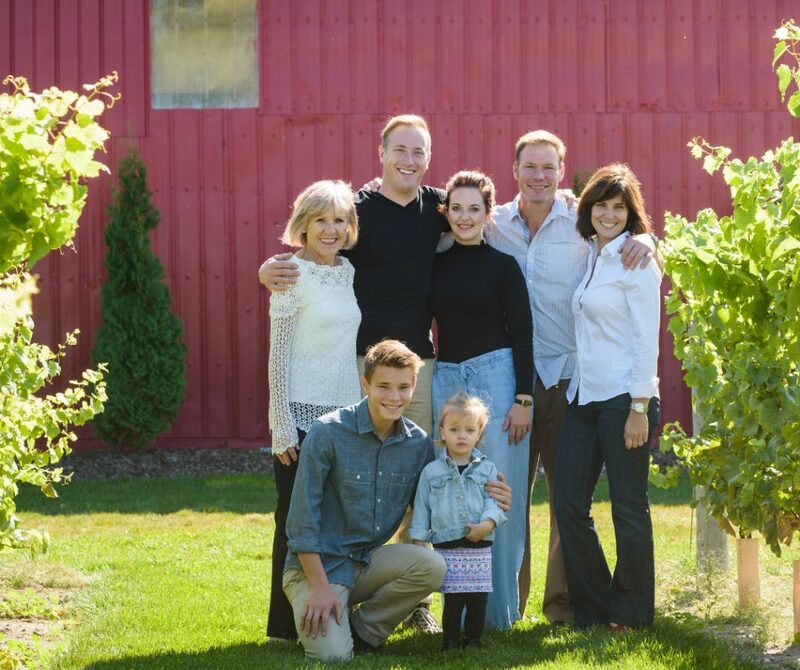 While inspiration for a vineyard at Hessenland bloomed many moons ago while Frank and wife, Liz, spent a semester in the south of France, the blue clay soil in St. Joseph and the unique offerings of the Lake Huron breeze have shaped the terroir for Schatz Winery. Planting hybrid vines that are resilient and healthy in this agriculturally rich farm land captures Schatz Winery’s offerings; excellent vines-turned-wines steadily thriving on a ‘quality over quantity’ mantra is the result! Building on the aptitudes of their neighbours and learning from mentors from across Niagara, Prince Edward County and Huron Shores wine regions, the Ihrigs carried out their first harvest in October of 2017. 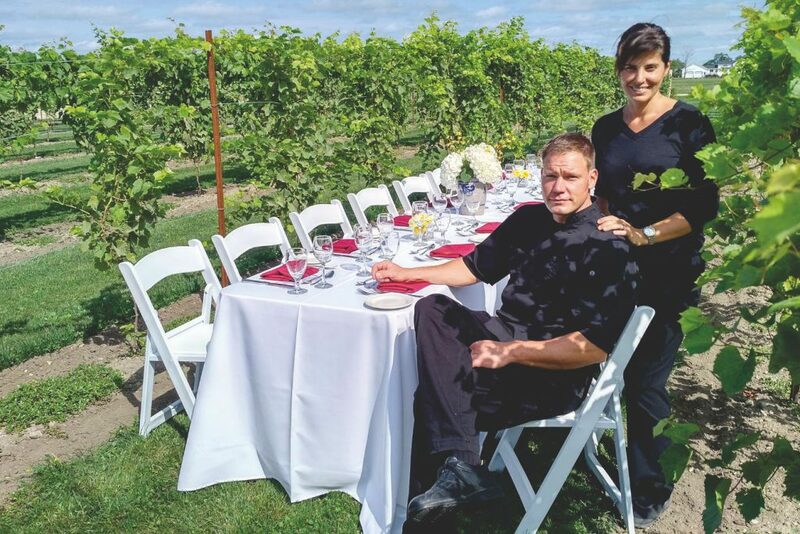 They were pleased to share the exclusive taste of their first homegrown vintage with guests at the 3rd Annual Long Table Vineyard Dinner which took place on October 13th, 2018. Select bottles of this collector wine will be available for purchase following from this event. The inaugural ‘15-35’vintage is comprised entirely of estate grown fruit aged in French oak barrels for eleven months. The vintage namesake offers a nod to the date of Schatz Winery’s first harvest on October 5th, 2017. For second generation owner-innkeepers Frank and Liz, this special moment in time also ushered in their 15th wedding anniversary along with echoing to this same date 35 years prior when Frank immigrated with his mother and Hessenland co-founder (with the late Ernst Ihrig), Christa, to Huron County. 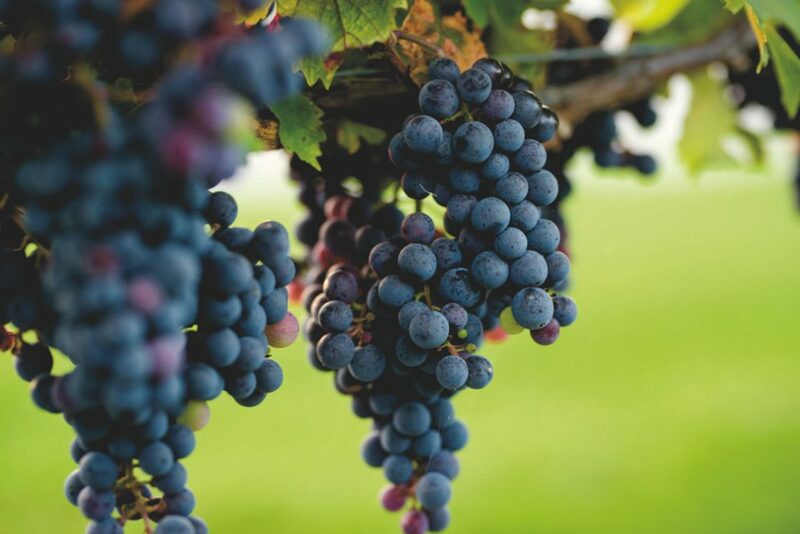 This Petite Pearl wine boasts an intense dark purple colour with aromas of blueberry, elderflower, damson plum and a slight earthy note with black olive and spice notes. The palate is rich and full bodied with a long finish and red citrus note. Looking ahead to 2019, the Ihrigs look forward to welcoming guests to the Inn for the Grand Opening of Schatz Winery (date to follow) with the plan of eventually opening distinct wine processing and tasting facilities to be built onsite by repurposing existing barn structures. From the Ihrig family to you and yours, Prost! 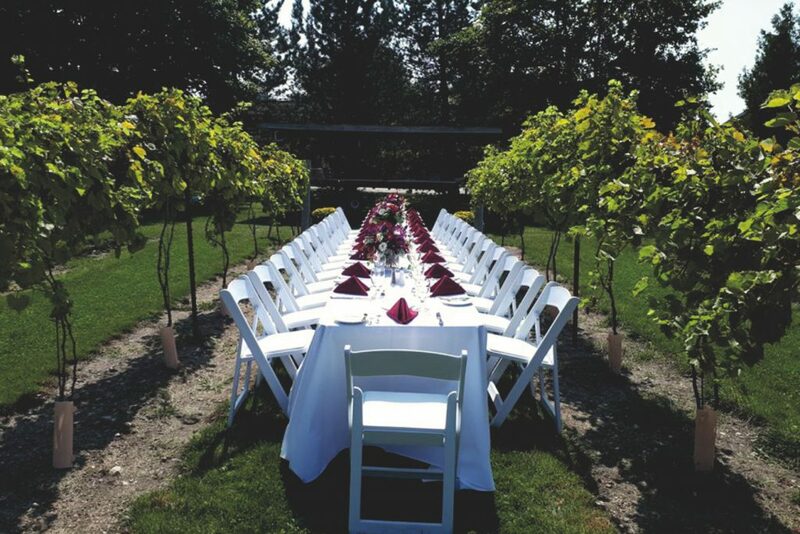 They are pleased to share the exclusive taste of their first homegrown vintage with guests at the 3rd Annual Long Table Vineyard Dinner on October 13th, 2018. For information on events, accommodation, winery tours and bookings, please contact us. We are conveniently located on the shores of Lake Huron between Grand Bend and Bayfield. it’s perfectly cozy, yet spacious. the atmosphere is warm & welcoming. the owners & staff, alike, are equally professional as they are friendly, and the food is amazing. always a great and memorable experience!!! What isn't amazing about this place? My wife and I got married here last weekend. The grounds are immaculate, the food incredible, and the staff are absolutely amazing. I can never have enough great things to say about Liz and her staff. She was fantastic throughout the entire process. Even when our DJ bailed on us 3 days out from the wedding, she was able to find us a more amazing replacement. Hands down, having our wedding here was the best decision we made! It was easily the best weekend of our lives! Our guests kept raving that it was the best wedding they've ever been to. We'll never be able to thank you all enough! Fantastic dining! A favourite spot for us to celebrate special occasions! Thank you to Liz and her staff for making our wedding day perfect. Leading up to the day Liz was amazing and always made us feel comfortable and confident. Everything was taken care of and it allowed us to just enjoy the day and not worry about anything. Exactly what we wanted for our wedding day. The property is beautiful and has amazing locations for wedding photos. Thanks again Liz! You're the best. it’s a beautiful place for a family vacation. had awesome time. 10 mins drive to grandbend beach. i wud always recommend it. This venue is very special and so are the people in it. Great food & great hospitality! Thank you from the bottom of our hearts for our amazing Mother’s Day supper. Liz opened up 3 rooms in off-season for my family so that we had a place to stay between visitations and funeral of our dearly loved Mémé. We are very thankful for your thoughfullness. Bless you. BTW..the beds were super comfy! Beautiful property, great rooms and wonderful staff. Will be back! We had our wedding at Hessenland and it was perfect!Liz and all the staff were fantastic to work with, and service was very quick and efficient. Liz kept everyone running on a schedule and let us know where we should be and when, this was a huge help to me as I was very nervous to walk down the aisle in front of so many people. The venue was absolutely gorgeous and the food was second to none. We couldn't have asked for a better place for our special day. The bonus was definitely the hotel availability with the venue being a distance from most guests homes. It was a very special day and they made it everything we dreamed of! Thank you Hessenland! From the moment I walked in the staff was excellent. Got there early and they allowed us in the pool until our room was ready. The grounds are immaculate. A pond, a waterfalls and gardens are all well kept and relaxing. Did not eat at the restaurant. Private beach and sunset are worth the stay. Just a beautiful property and love the guest house!! Everything was really lovely. I'll be back!! We had our wedding at Hessenland last weekend and it was a dream come true ! Planning a wedding from overseas seemed like a daunting task, but Liz made it a piece of cake, coordinating with her was extremely easy and she is such an amazing woman to work with. Liz cared about my special day as much as I did and it really showed, with her help we were able to plan the most amazing day. The venue is beautiful and the food was amazing ! I highly recommend this location even if it's out of town for you, the rooms are beautiful and the hospitality is next to none !! Had a very small wedding at Hessenland in the Garden Room and honestly had the most perfect day. Liz was the best to deal with, such a professional and so knowledgeable. Even though I knew next to nothing about planning a wedding she was there every step of the way to help guide me in the right direction. Frank cooked us the most wonderful meal that I had nothing but compliments about from my guests. The rest of the staff- to the people who set up and served food and drinks-everyone was fantastic! The atmosphere at Hessenland is so relaxed and comfortable. To anyone thinking of having an event there, staying there or just going for dinner (the Mongolian grill is AMAZING!) I highly recommend it! If you have never been...go! It's our go-to after a matinee at Huron County Playhouse or, on our most recent visit, a wine tour at Dark Horse Estate Winery followed by dinner at Hessenland to celebrate birthdays. The atmosphere, lovely and the food, delicious. Don't forget to take some time to either start or end your visit with a stroll around their lovely grounds and gardens. Hessenland is a picturesque Inn and restaurant set in a vast garden. The grounds are lovely and well kept. The staff is friendly and most accommodating. The food is delicious and some of the best I have ever had. Very peaceful and relaxing. We looked at a few places for our wedding before we found Hessenland. We had a very small party and most places weren't willing or accommodating for a small wedding. We felt those places only cared about numbers. When we called Liz, we met with her right away. She is so amazing. I'm not sure how she does it all, but she does and then some. She was with us every step of the way. She made the planning so much less stressful. She said it herself "think of me as your personal wedding planner " that took the world off my shoulders. We spent so much time with her, I couldn't imagine our wedding day any better. We love you Liz! ! Thank you!! Every time I have the pleasure of meeting with Liz at Hessenland I leave feeling more at ease and more excited about how our wedding day will turn out! I highly recommend this venue to anyone looking to plan an event, or take little getaway near the lake! I never want to leave when I visit HL! A true gem and treasure in our area! Liz and the staff were incredible! She was an amazing asset when planning the wedding and made sure our day went off perfectly. We had a beautiful sunny outdoor wedding in April and Liz and the staff made sure that the grounds looked incredible! The accommodations were perfect, the coach house was so beauitful for our day. The food was delicious and all of our guests had an amazing time! Thank you! Thank you to Liz and Frank for our most perfect wedding. Everything was so easy! Liz took care of everything and all of her staff were excellent to us and our guests. The whole 2 year process was easy thanks to Hessenland. The food was amazing as well! A perfect venue. My brother and sister in law were married at Hessenland yesterday and let me tell everyone this is one of the most beautiful venues I have ever seen. The staff was extremely friendly and kind throughout our stay and we left with giant smiles on our face! I would highly recommend them. Absolutely loved being here..very up kept and quaint and wonderful hospitality.... Definitely will come back here. Our very first time inside there, we were extremely impressed how lovely the grounds were. The service and staff were very efficient. We would highly recommend this venue for upcoming weddings and will share your website. Thank you for the experience. Perfect location, wonderful staff, fantastic food! My wife and I got married here. The staff was fantastic and so was the food! My husband and I got married at the inn on June 25th 2016, and from the moment we met Liz and saw the facilities, we were sold that this would be where we exchanged our vows. To start off, Liz was so informative and friendly, and went out of her way to answer every one of our many questions prior to our booking. After we made our final decision, she made sure to be available to us whenever we needed her as we planned our special day. She even went above and beyond to accommodate special requests from my parents! When the weekend finally arrived, our family and friends took over the resort for the whole weekend and Liz and her team made sure we were stress free, relaxed, and well taken care of! Our wedding day was nothing short of magical. The weather, the grounds, the food, the staff, everything was perfect. Liz was totally professional, on top of every little detail, and so kind to all of our guests. Even when we had an extra guest show up for dinner, Liz did not skip a beat and made sure there was a meal ready for them! She even went above and beyond to prepare a special meal for a family member who was going to have trouble with the heavy dinner due to some health concerns. I could praise her all day, but to sum it all up, she really is an angel in disguise. If you are considering Hessenland for any of your events, let me assure you, that you will not be disappointed and the entire family and all of the staff will go out of their way to make your stay perfect. My new husband and I cannot wait to go back and visit! Thank you Liz, Frank and all of the staff for everything! This is an absolutely amazing place. The grounds are beautiful, the venue is more than you could ask for and service is outstanding. Planning a wedding from afar has its challenges. We couldn't have been in better hands! Our ceremony and reception on site as well as a yummy breakfast with our overnight guests the next day, all turned out wonderfully! 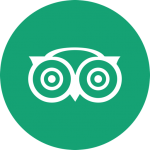 The service and staff were exceptional and we got many compliments on it. Liz went above and beyond to accomodate us and managed to incorporate many personal touches to help us have our dream wedding. As an event & wedding planner I work with a number of venues throughout a given year! My experience this week working with Liz and team was beyond awesome! Absolutely a fantastic space all around! Great staff, great space and so much fun to work with. I will definitely be referring future clients! Best wedding venue you could ever hope for. The staff are incredible and made the day so seamless. Liz is our hero! The gorgeous grounds, beach. and Coach House are just an added bonus as the team at Hessenland really makes this venue what it is. Our guests had nothing but positive things to say and it was the perfect place to bring everyone together to celebrate our big day! I was just in a wedding at Hessenland this past weekend and I must say how absolutely amazing everything was. The staff was truly a dream come true from the beginning of the day until the end. So accommodating and willing to help out in any way possible. The food was fabulous and likely one of the best meals I have ever had at a wedding and considering I am a wedding photographer and am at weddings most weekends that is saying a lot. The grounds are so well kept and just flawless. Something you would see in a movie or magazine. The day was perfect and I really can't say enough great things about the staff. Thank you Liz for always being one step ahead of the game and for having such a fantastic team!!! I will be sure to pass on this great review to future brides. Liz, I have so many great things to say about the Hessenland Country Inn. You were so great to work with, whether it be 1:00pm, or 10:00pm you were answering my emails, and updating my file as per my requests. You are very knowledgeable, and understanding and helped to guide me though the entire wedding process. I honestly couldn't have done it without you! The entire staff was fantastic, they were welcoming, helpful, and they all wore a smile, and had such a positive attitude. This is something that seems to be very hard to come by now-a-days. I can tell that the Hessenland is a great place for these people to work. I am still getting complements on the wedding, the staff, and how beautiful the location was, and it is all thanks to you. I am so beyond impressed and satisfied with the turnout of our wedding, Todd and I have already talked about seeing you in 10 years to host a family reunion at your location. I will miss our correspondence, but I am sure we will be back sometime in the future!! Gorgeous venue and amazing staff!!! Liz and her team are fabulous! Definitely a wonderful place to tie the knot. Hessenland is beautiful and the staff are even better. I look forward to coming back for future occasions. A wonderful memory made at Hessenland on our 10th anniversary- dinner and a sunset atop the silo! The servers got their exercise that night and we needed exercise after our fantastic meal!! Had the privilege of photographing a wedding here. The most accommodating staff...and the facility is beyond amazing!! From Helge and Walter Streich- 50th anniversary!! We've just assembled a big album with photos of our 50th. wedding anniversary celebrated on September 29, 2012 at Hessenland Country Inn. Once again we're filled with a golden afterglow. Everything was soperfect:the garden setting, the weather, the food ,the staff. Oh, the staff! All of our guests commented on the warmth and attention of the staff. Here are some of the comments received: 'You do everything so well' 'The catering by the Hessenland was absolutely wonderful with the weather co-operating too'. ' We had a very good time at your 50th. anniversary celebration. What a lovely party! ''How nice that we could enjoy the sunset in the garden! 'Our own family was very pleased with everything. You made us look so professional. The corsages and boutonnieres were waiting. The grounds were spotless, the outdoor seating just the way we had dreamed of. Our older son, who arrived in grand style chauffeured on a golf cart, truly appreciated his accessible room and the attentive food service. The champagne toast and hors d'oeuvres appeared at just the right moment. The hall looked gorgeous. Our younger son, who was the M.C., explained that because everything was so relaxed, it allowed our guests to relax and enjoy themselves also. The buffet was delicious. There was music and dancing. The evening concluded with a light luncheon. Everyone left happy. What more can we say? Thank you Liz and the Hessenland family for a truly memorable experience.